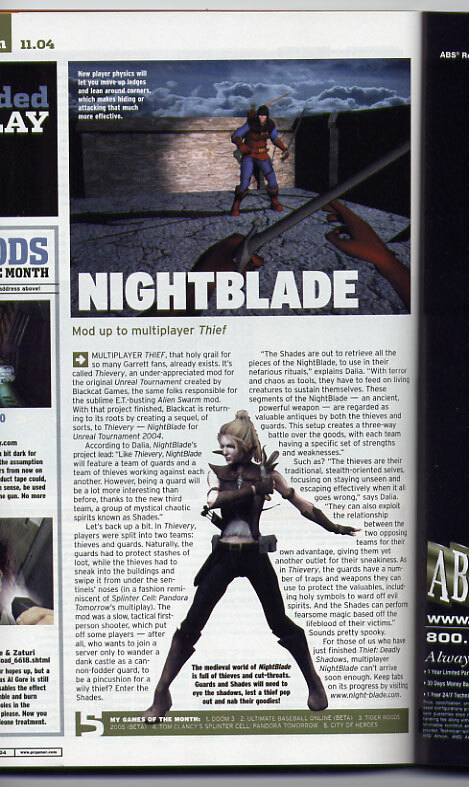 In the November issue of PC Gamer, there is half-page article about Blackcat and Nightblade, and there's a large full colour picture of oDDity's female thief model! Woot! Hats off to oDDity! I hope you'll still talk to the rest of us when you hit true celebrity status. WOOT! Way to go Oddity! Give the kid a job dammit. Edited by jay pettitt, 25 October 2004 - 05:46 AM. Why oh why wasn't this posted on our forums!? This is the UK version of PC Gamer, right? No, it's the North American one (if they're different). I'll scan it when I can get ahold of it.